Due to a strong response from Pacers fans, ALL tickets have been distributed to our highly-popular FanJam – which is a free, open-to-the-public event to celebrate the start of the new season. We have other great events coming up that Pacers fans can be a part of. Join us for our Opening Week presented by Kroger where we’ll have activities surrounding the first two home games of the season on Wed., Oct. 17 at 7:00 p.m. against the Memphis Grizzlies and Sat., Oct. 20 at 7:00 p.m. against the Brooklyn Nets. o Join us for the Inaugural Pacers 5K race at 9:00 a.m. on Sat., Oct. 20. Honorary Starter, Larry Bird, will tip off the race and Boomer, the Pacemates, the High Octane Drumline and Pacers alumni players will be there to cheer on race participants! More information is available at Pacers.com/5K. o Participate in our Opening Week Scavenger Hunt! Follow the Pacers on social media where you’ll learn more details about how to find great prizes throughout the city. o Join us at Scotty's Brewhouse (1 Virginia Avenue) on Fri. Oct. 19 at 7:00 p.m. to cheer on the Pacers when they hit the road to take on the Milwaukee Bucks. 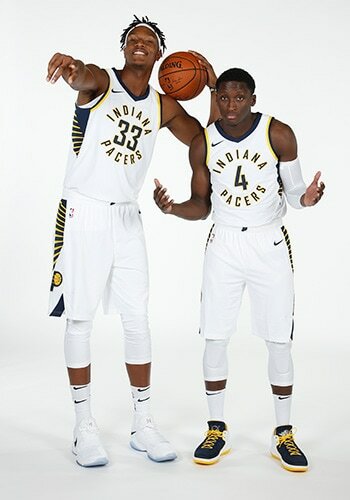 Meet Myles Turner, Victor Oladipo, and the rest of the 2018-19 Pacers at FanJam on Sept. 30.